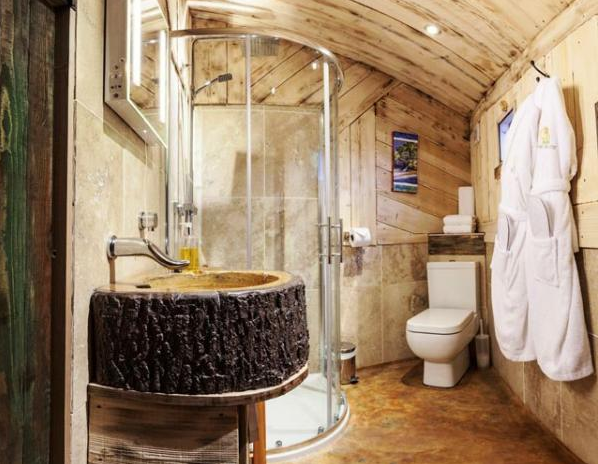 Oh wow guys, check out this stunning luxury tree house hideaway with a relaxing hot tub area. 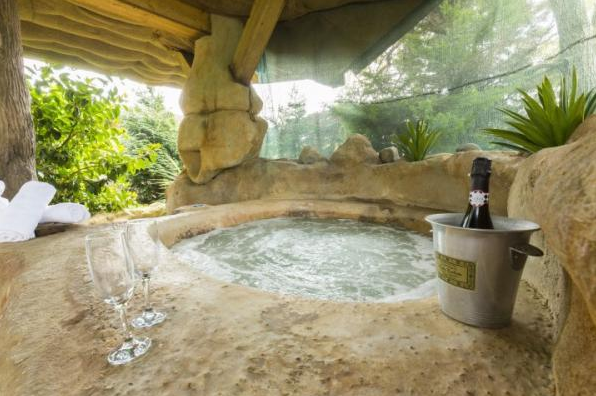 Located in the village of Blean and overlooking a wonderful wild life park this gorgeous hideaway makes the most wonderful little break. Forget your childhood memories of rickety, windswept shacks – this is a holiday in a treehouse as you have never experienced before! 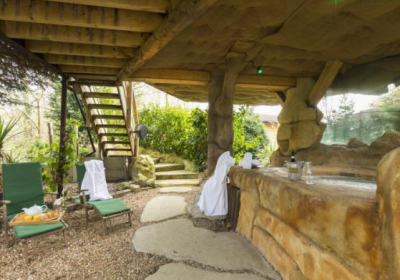 With under floor heating, separate rooms, Sky TV and a private hot tub, the Treehouse Hideaway offers peace, tranquillity, luxury and a totally unique experience. 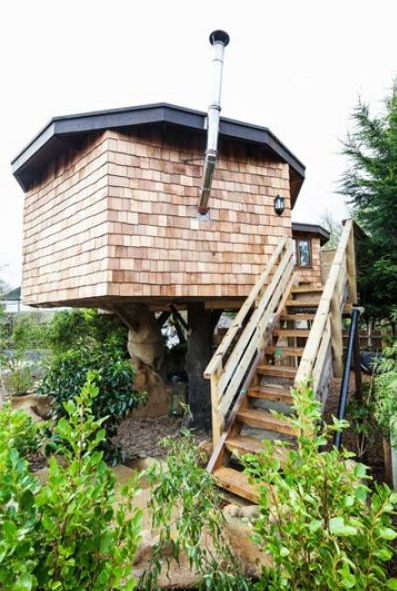 If you’ve ever dreamt of sleeping up in the trees then you’ve come to the right place. 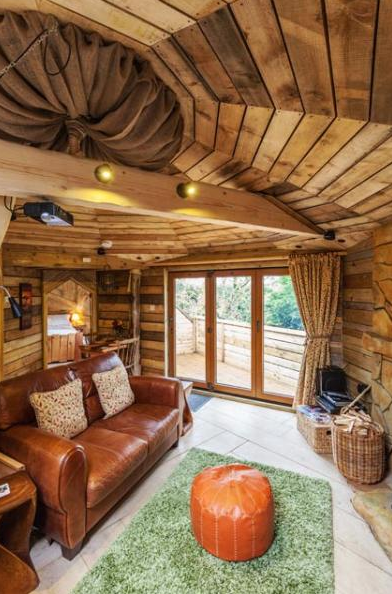 Here you can stay in a treehouse in style! Six metres off the ground amongst willows, conifers and fruit trees, the treehouse is made up of two hexagonal pods joined together, which sit upon two tree trunk pedestals. Boasting an unbelievable array of mod cons and little luxuries, it is hard to believe, once you’re inside, that you’re in a treehouse! This is the ultimate romantic experience just for two. The hideaway is up in the treetops, six meters from the ground and hidden among the fruit trees and willows. There are two hexagonal pods which have been joined together and fitted with an array of mod cons to make you feel like you’re home away from home. The underfloor heating and log burning stove is perfect for cosy winter stays making it perfect all year round. Relax watching TV in front of the fire or bask in the evening sunshine by the hot tub with the BBQ and chimnea burning away. Upon arrival, guests will find fresh linen, towels and a surprise happy with bubbly and there is parking available. Dogs are welcome but limited to one due to space however you can make contact with the owners to discuss any additional needs and they will accommodate where-ever they can. This is adult only accommodation. Linen and towels are included and with an added special touch of a hamper and bubbly on arrival. 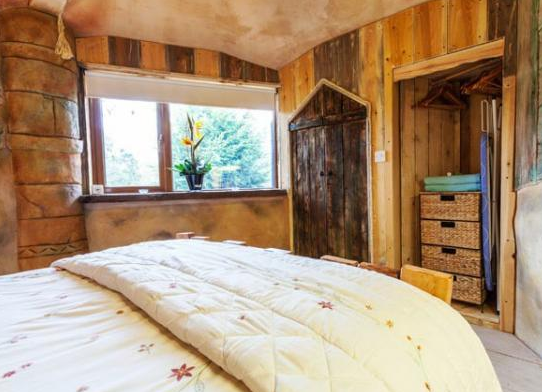 You can grab an overnight stay in the hideaway from £176.40 however there is a standard minimum 2 night stay (if you do see a single night on the calendar give the owner a ring, they will be more than happy to see if they can squeeze you in).